HOWEVER YOU FEEL ABOUT CLIMATE CHANGE, there’s one thing everyone can agree on: If sea levels rise, Florida’s coastline is in for trouble. So while treading lightly should always be important when you travel, it’s impossible to ignore when you visit The Beaches of Fort Myers & Sanibel. Both Fort Myers Beach and Sanibel are ideal for two-wheeled cruising. The biggest change in elevation you’ll find is when you accidentally pedal over an anthill, and year-round sunshine means there’s no excuse not to ride. 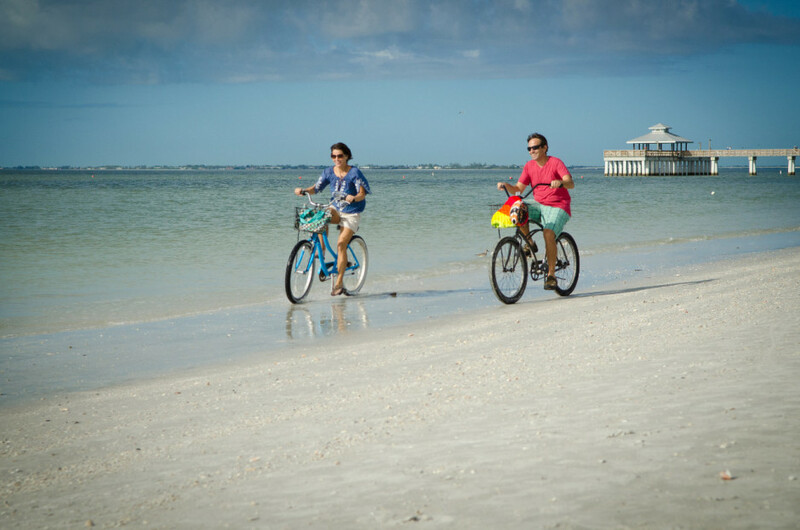 On Fort Myers Beach, Fun ‘N’ Sun Rentals will deliver a bike, helmet, and lock to your hotel for $30/week or $15/day. Across the causeway on Sanibel, Billy’s Rentals can hook you up with a single-speed / geared bike for $15 / $20 a day. For the past four years, The League of American Bicyclists has rated Sanibel as a “bicycle friendly community.” There are bike paths and bike lanes all over the island, and parts of the J.N. “Ding” Darling National Wildlife Refuge are best seen from behind a set of handlebars. Southwest Florida is the land of America’s wintertime tomatoes, but that’s hardly the only thing sprouting from local soils. 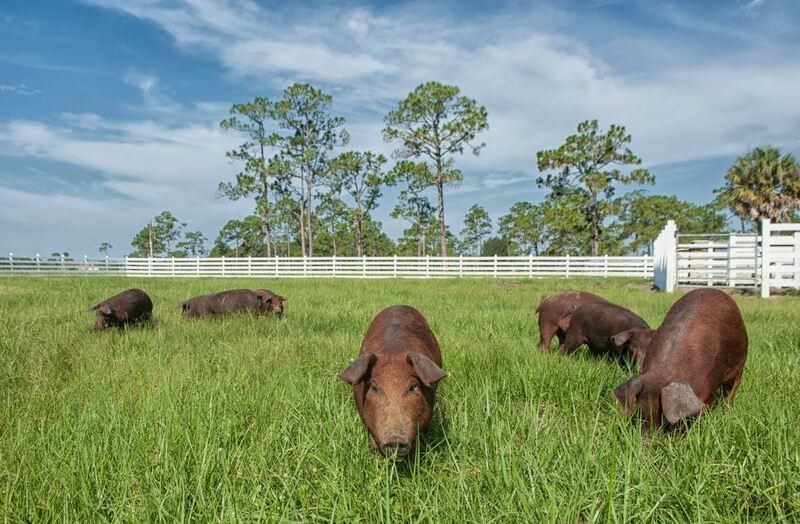 The locavore movement is catching on in Fort Myers, and small farms are hauling in impressive harvests of heritage vegetables, tropical fruits, and sustainably raised meat. To see the local food scene in all its soil-speckled glory, visit one of these local farms. Rosy Tomorrows Heritage Farm swings its gates open on Wednesdays for “Market Day.” The public can shop for produce and interface with the farm’s newest batch of wiggly piglets. Come before noon to get in on the chef-prepared lunch made from farm-fresh ingredients. Also nearby is ECHO, a nonprofit farm devoted to ending global hunger. Employees at ECHO work to find environmentally sustainable crops that will grow in drought-stricken environments. Take a tour of the farm and you’ll likely see new-to-you veggies and fruits being tested. You don’t have to go to a farm to get local food, though. Ada’s Natural Market in Fort Myers makes delicious (and deceivingly healthy) meals using local ingredients. Gulf “pink gold” shrimp are likely to be one such ingredient — the waters offshore of Fort Myers are a primary source of this delicacy. And don’t forget: Stone crabs, Southwest Florida’s signature seafood item, are a renewable resource. During stone crab season, fishermen catch the crabs, remove a single claw, and throw the critters back. By the following season the crabs have regenerated a whole new claw. Southwest Florida doesn’t have any self-declared “eco-resorts,” but many local hotels participate in the Florida Department of Environmental Protection’s Green Lodging Program. Initiated in 2004, this statewide program rewards hotels that commit to recycling, reducing water and energy use, and improving air quality. Ratings of one, two, three, or four palm trees (because it’s Florida!) denote which hotels are really taking environmentalism seriously. 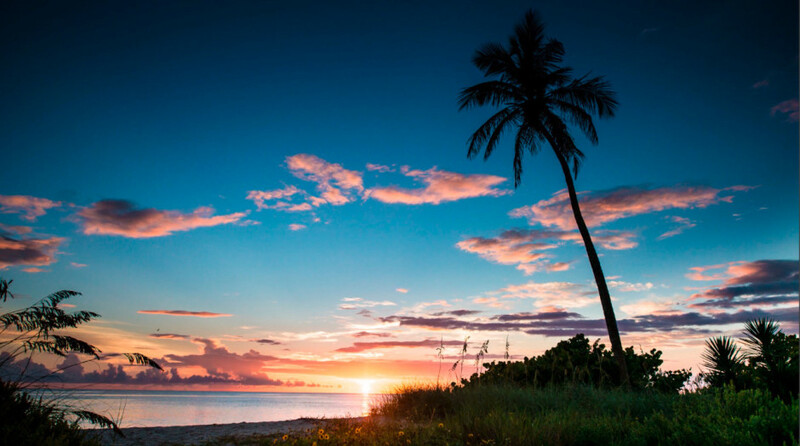 On Fort Myers Beach, Sanibel, and in the City of Fort Myers, there are close to 30 hotels that have received certification through this program. Most boast this certification on their websites, but the state also lists all participating hotels on a special website. And if you really want to stay responsibly, remember that simply picking an eco-friendly hotel isn’t good enough. Make sure you’re an Earth-conscious guest by switching off lights, opting out of having your towels and sheets laundered daily, and bringing your own soaps and shampoos to cut down on half-used bars being thrown in the trash. Pelican Preserve and Old Corkscrew Golf Club have both been certified as eco-conscious courses. To further lessen your footprint (and get a workout), skip the cart and walk from tee to tee. Explore the green (and blue) spaces. Southwest Florida has an amazing amount of preserved open space. Everything from seashore to inland swamp is available for exploring, and the best way to do so is under your own power. If you love the coast, sign up for an eco-tour with Gulf Coast Kayak. The company runs sunrise dolphin-spotting trips and midday paddles through the mangroves. You’ll release exactly zero pounds of carbon dioxide as you cruise along the water, and because paddleboards and kayaks glide along silently, you’ll see and hear more species of birds than you’d ever catch in a motorboat. For those who want a more do-it-yourself approach, rent SUP boards or kayaks from Gulf Coast Kayak and follow the Great Calusa Blueway. This 190-mile paddling trail traverses bays, inlets, tributaries, and estuaries as it meanders through some of Southwest Florida’s most pristine waterways. The entire route is clearly marked, so it’s suitable for traveling without a guide, and the water is usually so calm that no prior paddling experience is needed. Just southeast of Fort Myers, consider a trip to Audubon Corkscrew Swamp Sanctuary or Six Mile Cypress Slough Preserve. These protected landscapes offer a walk in the woods unlike anything you’ve seen before. Giant cypress trees with their otherworldly root systems create an idyllic habitat for alligators, birds, snakes, and brilliant orchids. Look for the super-rare ghost orchid, which must be kept under heavy surveillance due to the threat of orchid thieves. Take your time walking through the swamp — the slower you go, the more tiny details you’ll notice. He even teamed up with his neighbor, Henry Ford, to try and create an electric car that would run off of rechargeable batteries. As you wander around the grounds of these two stately homes, it’s impossible not to imagine the pair of early inventors tinkering away, dreaming of a more sustainable future. And really, that future is here in Southwest Florida — so long as you know where to look for it. Flying isn’t exactly a carbon-neutral activity, but fuel-efficiency rankings can help you choose a responsible airline. In a 2013 International Council on Clean Transportation report, Spirit Airlines was found to be the second-most fuel-efficient airline in the nation. (Alaska Airlines was first, but Alaska doesn’t fly in and out of Southwest Florida International.) Two other choices that garnered favorable marks by the ICCT — JetBlue and Frontier — also service RSW. If you don’t want to rent a car, LeeTran provides bus service from the airport to a transfer point in the city (there’s no bus service to Sanibel). The airport bus runs from 7:25am to 8pm, and the buses stop regularly along their routes, so be sure to allow enough time when you catch a bus back to the airport to go home. One cool thing about taking the bus: Over the past few years, LeeTran has transitioned half of its fleet to hybrid vehicles.